we are in a fairly new home...and yet this year we have little ants. In the spring and fall we spray around the house with home defence (sp?) It takes care of the massivly huge spider population which comes in the fall. The kids bring the rest of the bugs in! We haven't seen many bugs or spiders in this house, but I swear our last rental was built on a humongous ant hill! I battled those things all the time. 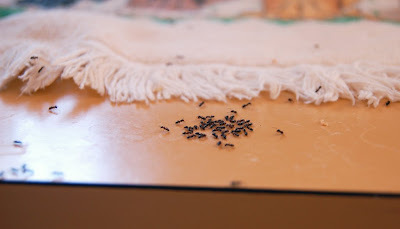 I did discover that cinnamon is a great ant deterrent. If you sprinkle it where they are coming in at, they hate the smell, so they stay away. Buy a pack of Terro ant baits, they have a clear gel inside with a small amount of Borax, which is relatively safe to people and pets. I see you have a kid tho, so keep it away from him and the pets in any case. Beats the hell out of spraying insect killer all over the house just to see them not die. They're kinda cute at first, but after about a year of the exterminator and spraying and RAID baits, I was very distraught. Good luck!